Some real estate matters can be complicated. Removing a spouse from a deed of trust or mortgage can be an overwhelming task without the proper information. This article will help to explain how to remove a spouse from a deed of trust in an efficient manner. The simplest way to begin removing a spouse from a deed of trust or mortgage is by a quit claim deed. If you want to remove a spouse from a deed of trust, you must first provide your lender with the reason for removing that person from the deed of trust. Is it in conjunction with a divorce or due to financial hardship? A quitclaim deed will work in both situations, but the lender on the deed of trust will need to approve removing a person from the deed of trust. A lender will want to know the reason for the removal because the lender will be losing that person’s income from the loan. It is important to remember that most lenders are in the business of making money not making friends. A quitclaim deed is a type of deed which transfers whatever interest the person signing has in the property. It does not provide any type of warranty that the deed is clear and marketable. The most common use for a quitclaim deed is in divorcing spouses or when the property is considered the property of an heir. By signing a quitclaim deed, the spouse is relinquishing all of his/her ownership in the property. The spouse’s interest cannot be given away without their knowledge. A quitclaim deed form can be found on several websites including All About Forms and The Easy Forms. The spouse signing the deed is called a grantor. The person receiving the property is called a grantee. Fill in the quitclaim deed with the name of the grantor and the grantee. A legal description will also be put into the form. A legal description is available from the Title to Real Estate or deed where the spouse received the property. Once the spouse signs the quitclaim deed, according to the state signing requirements, the deed must be recorded in the Office of the Register of Deeds in the county where the property is located. This will take the spouse’s name off the title of the property. They would no longer own an interest in the property. After the quitclaim deed is recorded, a copy should be given to the lender on the Deed of Trust. A lender must approve the removal of the spouse from the deed of trust. The lender will need to know that the person left on the deed of trust will be financially able to continue making the payments. Usually if divorce is the reason surrounding the removal of a spouse, a lender will work with the remaining person to modify or refinance the deed of trust so the loan is in one name only. Durand, Robin. 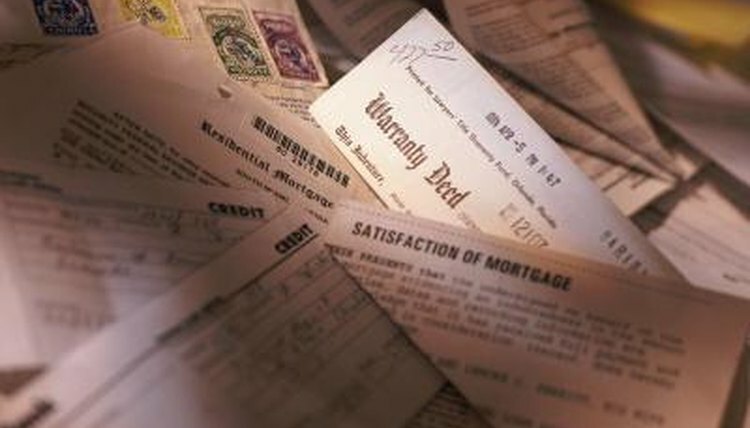 "How to Take a Spouse Off of a Deed of Trust." , https://legalbeagle.com/5840907-spouse-off-deed-trust.html. Accessed 23 April 2019. My Parent Died With a House Mortgage: What Happens?